How Does Enhanced Active FX Improve My Complexion? According to dictionary.com, complexion is defined as the natural color, texture, and appearance of the skin, especially of the face. For example: a clear, smooth, rosy complexion. So you’re in pursuit of the perfect complexion — but those over-the-counter products you’ve tried aren’t exactly cutting it. You’ve spent hundreds of dollars on creams and serums that promise to eliminate hyperpigmentation, smooth away wrinkles, and banish uneven skin tone. While they may help your skin temporarily look good, it’s not enough. You’re looking for a long-term solution that will help perfect your facial complexion! 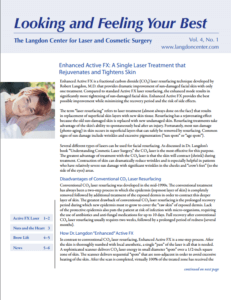 At The Langdon Center in Guilford, CT, Board-Certified Cosmetic Surgeon Dr. Robert Langdon uses Enhanced Active FX, a type of CO2 laser resurfacing, to help his patients achieve gorgeous, glowing, and even-looking skin. Enhanced Active FX works in a similar way to a chemical peel; however, it is a much more precise and predictable procedure. One of the greatest benefits of Enhanced Active FX is that it actually tightens facial skin and results in a remarkable reduction in wrinkles. 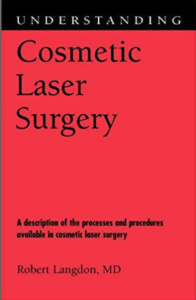 This technology uses CO2 laser energy to coagulate the top layers of the skin (the actual treatment is completely painless because Dr. Langdon uses local anesthesia to totally numb the skin surface). Over the next few days the superficial skin layers will gently flake off, revealing renewed, younger-looking skin. Virtually all of the splotchy skin and age spots from sun damage will be removed in only one Enhanced Active FX treatment! Whether you suffer from hyperpigmentation as a result of sun damage or just want to smooth away wrinkles and fine lines, Enhanced Active FX is a good solution for your complexion woes. Want to learn more about Enhanced Active FX and other innovative complexion treatments? Schedule a consultation with Dr. Langdon at The Langdon Center in Guilford, CT today by filling out the form on this page or calling 203-745-0340.